On a Tuesday evening in June of 2010, I walked into a nondescript classroom at a satellite campus of Albright College. The room was packed with about sixteen strangers, all looking as nervous as I felt. That fateful night we were bombarded with general information about the Accelerated Degree Program offered by Albright, and the Applied Psychology track in particular. I left four hours later completely overwhelmed but very excited. I was going to finish my college education approximately twenty-two years after I started it. From the original group that met that night, eleven of us persevered through the program. Every Tuesday night for twenty-two months, we met for four hours to study subjects like Group Dynamics, Abnormal Psychology, and Statistics and Research Methods. Courses lasted five weeks and almost every one required hours of reading, lengthy papers, and presentations. My professors came from diverse backgrounds ranging from social psychology and business management to human resources and education. They educated, inspired, and befriended us. In the midst of the grueling schedule, my cohort became a stable group of friends who encouraged and supported one another. I do not use the word grueling lightly. For my part, I often sweated blood completing assignments. Just for kicks, I tallied up some of the work I’ve done over the last two years to earn my degree. For my major area of study, I’ve written 51 papers (348 pages total with a mean of 6.82 pages per paper), given thirteen presentations that were approximately 15 minutes each – all accompanied by Powerpoint, and read at least 83 empirical psychological research studies. Many of the research papers I wrote were over 10 pages long and written in APA format. I can’t even begin to count the number of pages or chapters that I’ve slogged through (sometimes entire textbooks), or the number of statistical calculations I struggled to complete. My capstone project was a research study evaluating locus of control and level of education in relationship to adaptability to coping with stress. I created, designed, and executed the study with the help of my professor, Dr. Lora Kasselman. The survey alone included over sixty questions. Deciphering the results, figuring out the statistics, and writing the subsequent paper was a monumental task. 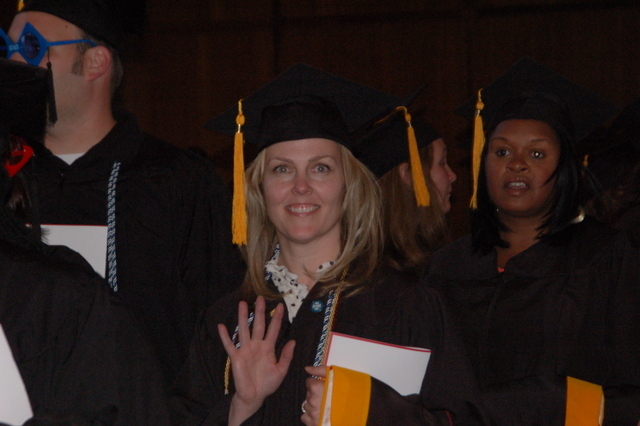 In addition to my major studies at Albright, I needed four general education courses to complete my degree. For English Comp, I studied, took, and passed a CLEP exam. The other three course requirements were fulfilled at the local community college. (I’m an adjunct professor there so my courses were free.) Two of the courses were accelerated with a heavy reading and writing load and two were Internet courses that required me to be on-line almost daily. Just for these three courses I wrote 11 papers with a total of 56 pages (averaging 5.0 pages per paper). I also did two presentations (with Powerpoint) and did a ton of writing for on-line discussion questions and group interactions. In my infinite wisdom (not! ), I took the two accelerated courses during Statistics and Research Methods and the full semester Internet course while I was working on my capstone project. Looking back, I’m amazed at what I completed. I honestly don’t know how I did it. No wonder it felt like I didn’t have a life apart from school. The reality, though, was that I did have a life – a busy, complicated one. So did everyone else in my cohort. We had marriages, children (four of which were born during the program), jobs, homes, and numerous other responsibilities. During the course of our education there were relationship issues, health problems, and job changes. We constantly struggled to balance the requirements of school with the other important areas of our lives. In this regard, I felt like I actually had it a bit easier than most of my fellow students because I worked part-time and my kids were mostly self-sufficient. Many people had full-time jobs, young children, or both which made a successful attempt at higher education even more difficult. Personally, as a non-traditional student, I often felt scatter-brained, distracted, and unavailable to my family. Over the past two years the Whimsey clan has walked a very fine line between barely organized and total chaos. Many, many sacrifices were made. Through it all, my husband was my rock. He endured my whining, my moments of self-doubt, and the occasional temper tantrums with grace and humor. He was my editor, my voice of reason, my shoulder to cry on, and my financial backer. Saying I could not have done it without him is the understatement of the century. My kids routinely dealt with a dearth of clean clothes, an empty pantry, my absent-mindedness, and my almost constant involvement with the family computer. In return for my benign neglect, they have been my biggest cheerleaders. I survived and thrived because of the support of my family. When I walked into that room the first night, I was already determined to do my very best. If I was going to commit to this endeavor, I was going for the gold. Those nearest and dearest to me would testify that I have poured myself into my classes and my assignments, always working for the goal of graduating with honors. Yesterday afternoon, my efforts were rewarded when I realized a long-held dream. 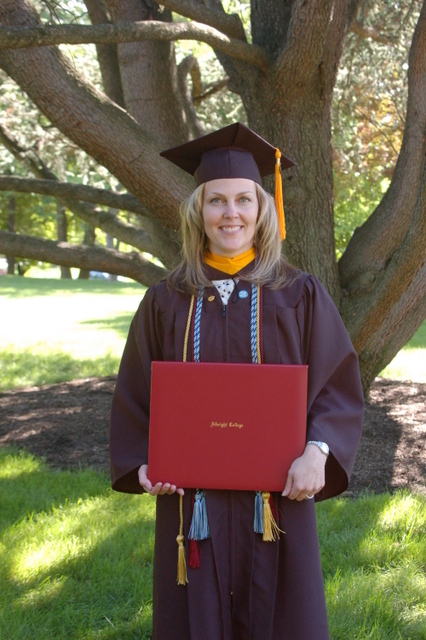 I graduated from Albright College with highest honors and a Bachelor of Science in Applied Psychology, wearing the cords of Psi Chi (International Honor Society of Psychology) and Alpha Sigma Lambda (National Honor Society for Non-Traditional Undergraduate Students). In all of my forty-three years on earth, graduating with such distinctions has been one of the most deeply satisfying moments of my life. It was also incredibly moving to graduate with a group of individuals who I know worked just as hard to realize their own dreams as I did to realize mine. With the bagpipe processional, the enthusiatic commencement speaker, and the cheering of family and friends, it was truly a day filled with happiness and celebration. At this moment, my soul is overflowing with sweetness…. Thanks for the words of affirmation, Stefan. And thanks for following Whimsey Pie. haha great last photo. 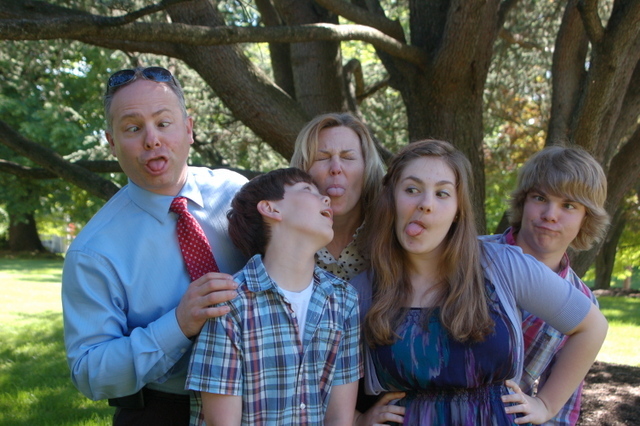 Every family should have a funny face picture. Congrats!! Hi, Kristin! Funny face pictures are a bit of a family tradition at our house. After any serious photos are taken, we like to let loose and have a little fun. Thanks for the enthusiastic kudos! It doesn’t quite feel real yet. Congrats on graduating. Now it’s time for your San Diego trip. Enjoy! Congratulations on the Bachelor’s Degree; something I sometimes wish I’d been dedicated enough to do. It’s never too late. I’m living proof of that. As a matter of fact, I believe the reason I did so well was because I was old enough to know that I really wanted it. Thanks! The glasses were a gift from one of my classmates. Thanks for sharing these comments. I was happy to come across this today. If there is anything I can ever do for you, let me know. I’m glad I could add a bit of happiness to your day, Kevin. I had a superb experience through the accelerated degree completion program at Albright so I’m always happy to talk about it. I’ve just begun a Master’s program through Rosalind Franklin University; my education at Albright was perfect preparation. I am going to be starting the Accelerated Degree program next month for the same program. I was wondering if you had success in obtaining a job in the field? Also if obtaining your masters will qualify you to become a therapist? I was already working in post secondary education as an adjunct instructor in an Allied Health program when I began the Accelerated program at Albright. My degree enabled me to apply for and receive the position of Director of Clinical Education for the same program. 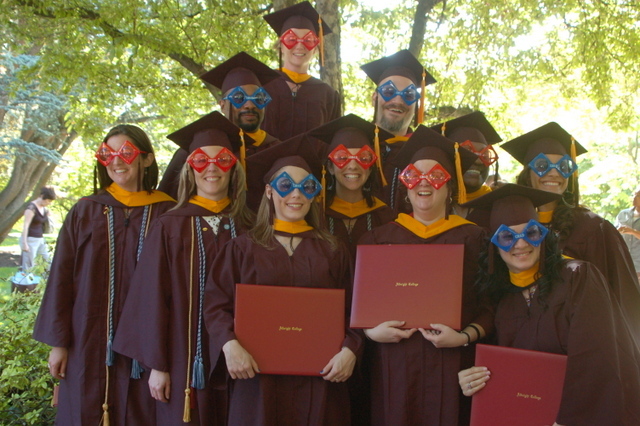 The Applied Psychology program has a component related to management and human resources; a few of my classmates pursued jobs in those areas after graduation and were successful in finding employment. If you are interested in psychology, you will probably have to continue on to a minimum of a graduate degree. Counseling and school psychology are fields that require only a Master’s level degree for employment. I hope this helps. Good luck to you on your educational journey – I really enjoyed my experience and I hope you do, too! Hi Stephany! I randomly came across this article, and now I am so happy that I did. I am currently in Albright’s Accelerated Degree Program (Media 5) and we are only 6 months away from finishing!!!! I wanted to share this with my cohort for some extra motivation, but I’m not finding a sharing option, and ideas? This article gave me a wave of emotions that was unexpected, but at the same time an awesome feeling! Congratulations on the imminent completion of your degree and graduation from Albright! I thrilled you were able to connect with some of what I wrote in this post and honored that you want to share it with your peers. I don’t have a sharing option and am not sure how to make that happen with this blog. The only suggestion I can make is to copy the post link and share it by e-mail or on some form of social media. I know how hard you’ve worked to get where you are in the program so I’m sending you a cyber high five. Best wishes to you as you finish your degree and begin a new stage in your profession life.